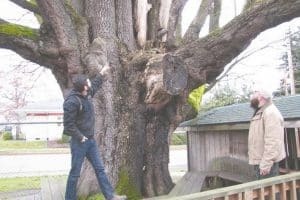 The Bo Baggins daycare, Sitkum Tree Service and the City of Port Angeles contacted us about a potentially high-risk tree in uptown Port Angeles. A large tree branch had recently fallen onto the Cherry Street and taken out the power until City crews arrived. The tree was ancient, we counted over 100 years after the tree was removed. The tree was previously logged at the base, roughly 2 feet high, and regrew into multiple small trunks. These trunks had also been topped in the mid-1990’s. The recent tree topping proved too much for the tree and it succumbed to multiple wood decay fungi, notably Ganoderma applanatum. A conk of the fungi was visible directly underneath the previously fallen branch, which also was just a few feet below the old topping cut. Unfortunately, the tree required removal to remediate it’s high-risk as a habitat conversion was not applicable.